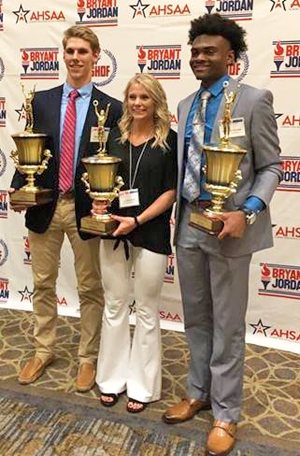 Marion County High School’s Braden Pyron, Cleveland High School’s Tara Randolph and Huffman High School’s Cameron Humes were selected the overall state winners at the 34rd annual Bryant-Jordan Student Athlete Awards Banquet Monday night at the Birmingham Sheraton Hotel. A total of 104 high school regional senior honorees were recognized and awarded more than $380,000 in scholarships. Pyron, a four-sport standout at Marion County, located at Guin, was the recipient of the Larry D. Striplin, Jr., Scholar-Athlete of the Year Award. And for the just the second time in Bryant-Jordan Program history, Randolph and Humes were named co-winners of the Ken and Betty Joy Blankenship Student Achievement Athlete of the Year Award. The first were Darren Edwards of Pell City and Johnny Thompson of Sulligent in 1992. UAB head football coach Bill Clark was the guest speaker.